A new cafe opened its doors for business in Nadi yesterday yet with a new twist from Auckland, New Zealand. Cafe O experience was created in New Zealand by Fijian-born John Oyagawa, a chef by profession. He has been refining culinary styles for more than decade creating dishes with modern contemporary delivery. Cafe O offer breakfast, lunch, coffee and home baked treats in modern yet casual and comfortable settings. His sister Cherie Oyagawa – Smith and husband Justin Smith are proud of their investment. Ms Smith was born in Suva and moved to Auckland at an early age with her brother John. With years in the tourism industry she said it was a dream to set up such a niche in the ever-growing market. “Our philosophy is simple – Eat, Drink, Relax and Enjoy,” she said. The Cafe’s Opening hours are 7am – 5pm (Monday – Saturday). Cafe O located at Eden Plaza in Martintar, Nadi. Head Chef Zuber Ali, 27. Moved to Canada in 2008 and worked at Moxis Classic Grill in Edmonton as sous chef for three years. Returned to Fiji and worked at the Fantasia Island Resort’s Greek restaurant as head chef. He then worked for Bulaccino cafe and restaurant in Nadi. Mr Ali brings a fascinating skill set to Ms Smith’s team at Cafe O. “There is a different style here. We serve food at Cafe O, to know more you simply have to taste and feel it for yourself,” he said. Born and raised in Martintar and was educated at Nadi Muslim College. Fell in love with cooking at an early age and took on Food and Nutrition subject whilst at Nadi Muslim. After form six he went on to complete his trade corticates in cookery I, II and III at TPAF (formerly known as FNTC then). 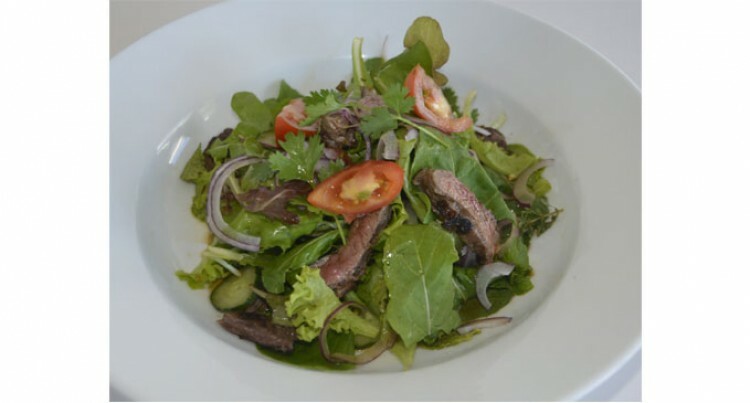 Thai Beef Salad (with tomato, cucumber, mint, coriander, red onion, lettuce, and lime chilli dressing).